It’s inexplicable that anyone (let alone the usually reliable Almeida) would decide to stage this pointless mess of a play, let alone throw away such a superb cast on it. The plot is all about an architect (aka The Master Builder, Stephen Dillane) who is basically trying to maintain his business through incredibly convoluted means, including burning down his own house and seducing his apprentice’s fiancé. He also believes that he can make things happen just by thinking them. Yep, pretty looney. But you haven’t heard anything yet. His wife (Anastasia Hille) spends her whole time mooning about looking unwell, watering the stage and going on about duty. Clearly a psycho. The fiancés (Emma Hamilton and John Light) are comparatively sane, although he does seem to have been told by the director to “dial it up to 11” in the acting department. At one point he says something mundane like “Hello” and delivers it like Henry V storming the breach at Harfleur. But back to the subject in hand: which is crazy people. Gemma Arterton. Gemma Arterton. 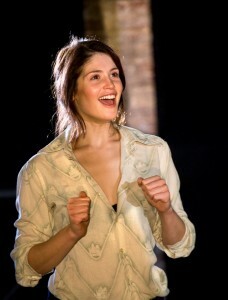 She’s very good: she’s willowy, moves wonderfully and is utterly arresting in her performance. But I’ll tell you what, her character isn’t half bonkers. It’s impossible to understand or relate to a single word of what she says or thing she does throughout the whole 105 minutes. Perhaps the point? Maybe. But it does make it very frustrating after a while to have a central character behaving completely bizarrely, consistent only in her strangeness. The staging is, well, minimalist. We get some gravel, two chairs, a lectern and, at one point, a jug of water. Apart from that it’s Austerity Norway. Perhaps. Perhaps if I did read the text all the arm waving and shouting and mentalness would reveal an inner coherence and meaning of real power. Perhaps Ibsen (I didn’t make much of the sodding Doll’s House either for the record) is just beyond my intellect. PerhapsThe Master Builder is a superb play and this production a seminal one of it. But for my money: too many crazy people. I don’t know about the actual performance at the Almeida, but I have to agree with the lady that it is a great play. If you are interested in my personal view of the play just read this http://das-unmoegliche.blogspot.com/2010/10/das-unmogliche-musings-on-ibsens-master.html.